“The ‘Car-Oriented City‘ as an Area of Conflict. Open Space Planning in Inner-City Areas as an Urbanisation Strategy in East and West Germany since 1945“ is the title of the lead project in IRS’ Department for Historical Research. It departs from the assumption that although the impact of automobile traffic on post-war urban development is widely recognised, the strong inner contradictions of this reconfiguration process are often overlooked. To investigate these contradictions, the project’s research agenda is focused on the expansion and dismantling of ‘car-oriented’ city structures, the appropriation of urban space by habitants, the circulation of the ‘car-oriented city’ as a guiding planning principle and the role of local actors as well as the comparison between Eastern and Western Europe. These and other research questions as well first outcomes were up for discussion at a workshop in Berlin that forms the subject of this review. While the disciplinary key focus of the workshop lay in highlighting the role of the car at the interplay of transport and urban history, the strategic scope of the workshop was the intensification of academic exchange between Central and Eastern European scientists working on the concept of ‘car-oriented cities’. In his introduction Christoph Bernhardt (IRS) gave an overview of the development directions of the ‘car-oriented city’ and highlighted current research questions, for example whether the 1970s could still be regarded as the turning point in mobility planning. Aspects of building culture in traffic architecture were the topic of Andreas Butter‘s (IRS) talk. He pointed out that a reorientation of the time-space-regime was fundamental for automobility-intended planning. 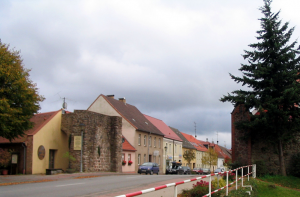 The building of tunnels, fly-overs and the like provoked novel sensory experiences but also experiences of loss caused by the demolition of pre-automobile architecture: Not only big cities like Paris fell under the spell of a general speeding up and tore down of significant buildings for highways, but also provincial towns – like Lychen in Eastern Germany where the medieval town-gate was razed to a fragment to facilitate the traffic flow. Today, however, traffic architecture from the era of the ‘car-oriented city’ forms the target of dismantling projects. In his commentary to this first session Steffen de Rudder (Bauhaus-University Weimar) remarked that the reasons for the planning and dismantling processes are yet to be fully analysed. As an example he named the interaction between the different driving forces behind car-oriented urban renewal which has not been sufficiently investigated. The following discussion returned to the question of the crucial watershed for the attitude towards the ‘car-oriented city’: had it been the intellectual discourse in the 1960s or a changing public opinion in the 1970s that caused the rethinking of strictly ‘car-oriented’ concepts? 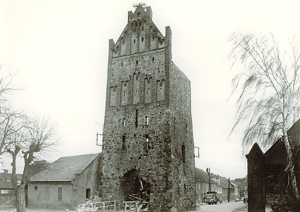 The town gate in Lychen (Eastern Germany) before demolition in 1976 (Photo: Municipality of Lychen) and today (Photo: Andreas Butter). The second session “The Car and the City in Eastern Europe ̶ The Case of Poland” began with Błażej Brzostek‘s (University of Warszawa) account of car traffic development in Warsaw. Opposing the European trend, private car-ownership in Warsaw sank until the mid-1950s while the state apparatus acquired an impressive car fleet. This fostered social tensions because for the population the car was a strong symbol of Western modernity which they were denied. It was only in the 1960s that Warsaw began to catch up with motorisation and promptly installed the ‘car-oriented city’ ̶ although the term properly did not exist in Polish language ̶ as a key planning principle, aiming at separating traffic systems. Hubert Wilk (Polish Academy of Sciences) analysed garages and parking areas as places of social conflict. Despite the small number of conflicts over parked cars, the car-triggered occupation of public space arose in Poland as early as the 1940s. Just like in Western Europe environmental issues and the topos “cars vs. children“ were central in Polish debates. Another remarkable aspect that was also expanded in the discussion was the non-automobile use made of private garages as free (-time) space, especially for the young. Thus, the rows of garages constitute a lieu de memoire for a youth in socialist Poland. Recapitulating the post-war urban development of Gdansk, Piotr Lorens (University of Gdansk) explained that this city had applied two different planning principles to two different parts of town in order to pursue two goals at the same time: Whereas in the old centre flats for the working classes were built with reconstructed 17th-century façades to encourage a Polish, socialist identity, for the rest of Gdansk planners wanted to transform the city into a modern, car-oriented city – even if that meant relying on plans from the German occupation. This example invites researchers to take into account the entirety of a city and its history when studying traffic solutions. Similarities and differences between Poland and other Eastern and Western European countries were the main focus of the following discussion. Participants evoked especially the car‘s role as a symbol for freedom and opposition to the system. In contrast, opposition against car-oriented urban renewal was the subject of the last session “Conflict Issue‚ Car-Oriented City‘“. Harald Engler (IRS) presented the formation, background and organisation of car-critical urban movements since the 1970s. These existed also in the GDR – although under the cover of the Protestant Church. As part of the larger urban environmental movement they were well connected, used appropriation of public space as a form of protest and often succeeded. Fundamental oppositions between automobile and other uses of public spaces were traced in Angela Jain‘s (Technical University Berlin) talk “Mobility and Appropriation of Urban Spaces in Conflict“. Regarding the transformation from automobile to more sustainable traffic systems planned today, Jain warned that in contemporary planning discourses normative ambitions tend to dominate over the actual structural possibilities, especially in smaller towns. Sebastian Haumann‘s (Technical University Darmstadt) commentary focused on two essential questions: First, how does appropriation create change, and second, in what way do conflicts over the ‘car-oriented city’ relate to concepts on a higher scale. During an animated final discussion of this one-day workshop, the car-oriented planning‘s image of rationality was a prominent issue: It is particularly the rational image that needs to be challenged in order to better integrate the symbolic character of traffic architectures. Moreover, participants agreed that path dependency is a helpful concept for further research on the ‘car-oriented city’ as it allows to manage the diversity of planning and dismantling projects chosen in different cities. Also, it turned out that the assumed hegemony of one means of transportation deserves further study: Just as public transport never vanished from the European ‘car-oriented city’, it is necessary to question if the modal change propagated today really bans cars from the city or rather just relocates and hides them. To treat this and other issues it was called for a better integration of research on conceptual planning and actual use of traffic solutions. Finally, it was agreed that comparative research on the automobile’s impact on post-war urbanisation in Eastern and Western Europe should be pursued further as it tends to highlight this development’s inner contradictions.